Minimize downtime, lower costs, and reduce risk: Those are the three goals your disaster recovery plan must meet. But, as the need for "always on" capability and business continuity has increased, so has the complexity and labor intensity of maintaining a reliable disaster recovery plan. Discover how a cost-effective, high-availability architecture offered by Dell and VMware can lighten that load. 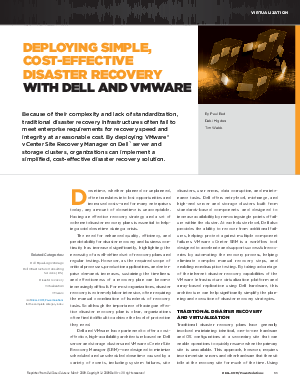 This white paper outlines the ways virtualization can address the challenges of traditional disaster recovery and help your enterprise meet the key goals of a viable disaster recovery plan.